Modern Improvisation is a concept that I’ve investigated quite a bit over the last 25 years. I first started learning about this when I attended the Berklee College of Music, but I was most influenced by my private teachers, including but not limited to Mick Goodrick, Jerry Bergonzi and Charlie Banacos. Many of the topics I cover in my books are derived from what Charlie Banacos taught. If you would like to see the music genealogy of Charlie Banacos and some of his students check out Bruce Arnold”s Music Education Genealogy Chart. Charlie certainly pointed me in the right direction and you can definitely see his influence on how I put courses together. But many of the books I mention here are not specifically what Charlie taught me, but rather, further explorations of what he had me work on throughout my 5 years of studying with him. I learned many things from all these aforementioned teachers, but in this post I’ll limit our discussion to theories of contemporary improvisation that I’ve formulated. The list is always growing, so you should check back periodically to muse-eek.com for updates. The material herein either teaches a technique, explains a theory, gives exercises to master an improvisational concept, or directs you to reference books. Many of these books cover the theory of what I call “Pitch Class Set Improvisation,” a concept of applying pitch class set theory to jazz improvisation. Charlie Banacos never taught pitch class set theory though I did study his 23rd chord concept which is a way to organize three 7th chords in a 12 tone aggregate. You can hear an example of writing and soloing with 23rd chords by listening to the composition “Blue Eleven” from my recording of the same name. 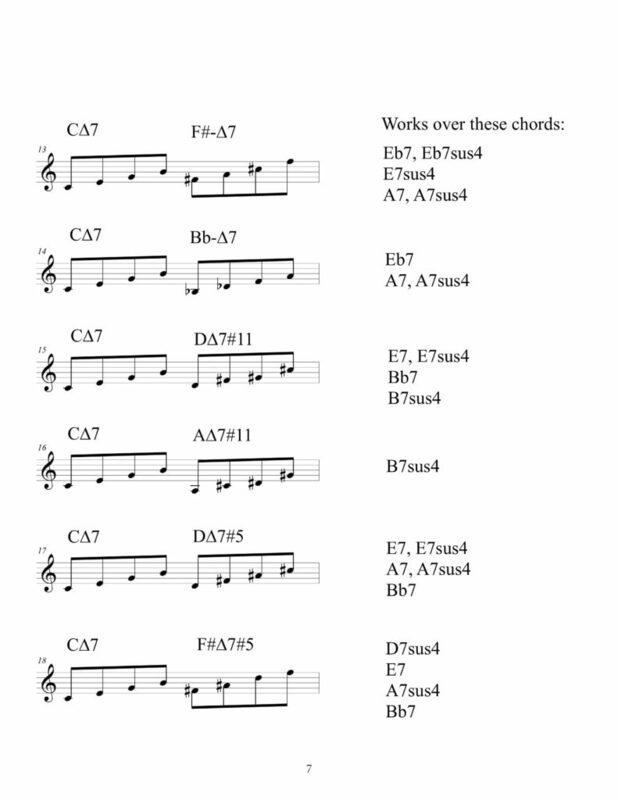 You can find a complete list of these 23rd chords in the book Tools for Modern Improvisation. Charlie also had me singing through Arnold Schoenberg’s “Funf Piano Pieces.” which I ultimately ended up recording with the group “Spooky Actions.” You can see a list of that group’s recordings here. As I have said, most of the courses listed here are certainly influenced by Charlie Banacos’ techings. But to my knowledge Charlie never dealt with pitch class sets. I never heard him mention the concept. My personal opinion is that pitch class set theory is a great way to organize sound and many structures that are used in pitch class set theory provide an array of improvisational ideas and options. Therefore I call these concepts “Pitch Class Set Improvisation.” If you are new to pitch class set improvisation I suggest getting the Sonic Resource Guide. I also give examples of how “Pitch Class Set Improvisation” has been used in the classical recording I’ve done in Improvising on Classical Masterpieces. One thing I want to stress is that the theories in these books are not just abstractions to me. I’ve used them extensively in my recordings, as compositional and improvisational tools. They are very flexible and can also be used across multiple idioms. Follow these links to a CD that uses “Pitch Class Set Improvisation” in a Jazz, Rock, Metal, Country, Free Improvisation, World Music and Classical setting. I believe that in order to really understand an improvisational concept you need to write and improvise within it. Many of these books were written as a method that I developed to widen my own skills with “Pitch Class Set Improvisation.” Therefore you may also find them useful if you find the sounds created by these concepts intriguing, and want to work with them..
I’ve written many books on “Pitch Class Set Improvisation.” Here are a few example pages from these books and some explanation on how you might use this material. 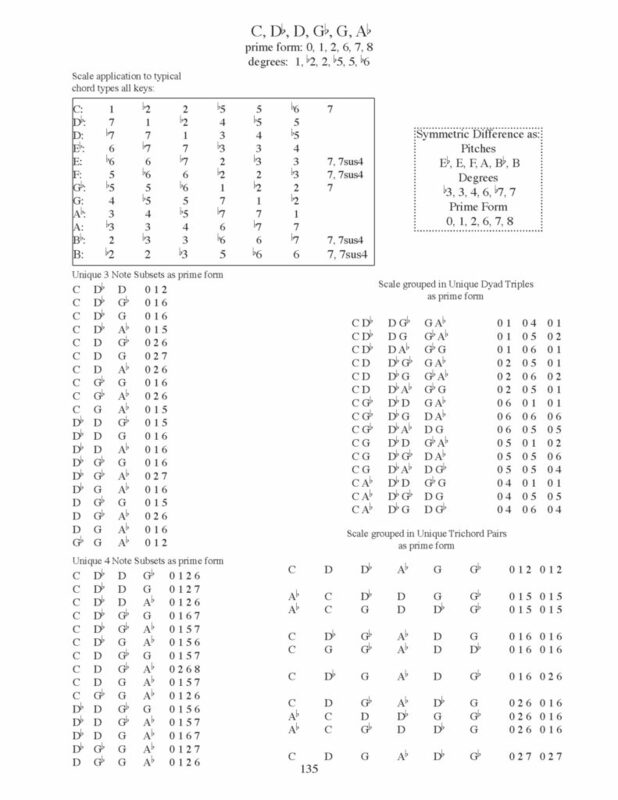 Lists of 12 tone aggregates that can be formed from the 12 three note pitch class sets. All Hexatonic scales broken down into two trichords. A list of every chord that will work over this scale in every key. The scale that would be formed by the 6 notes you are not using. i.e. the Symmetric Difference. 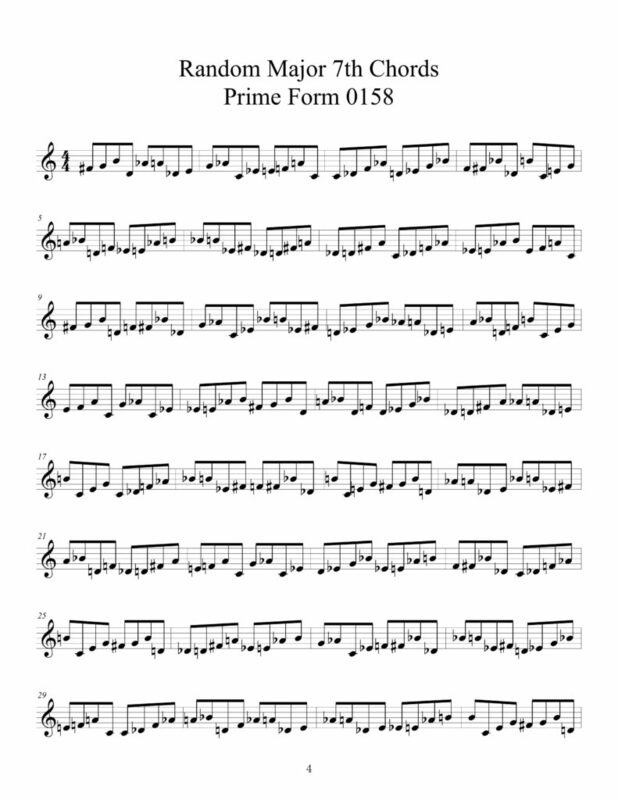 A list of all 3 note subsets in prime form. A list of all 4 note subsets in prime form. A list of all the ways to make this scale into 3 two note groups. A great improvisation method. A list of the ways in which you can make hexatonic groupings via two three note groups. This is another great improvisation method. 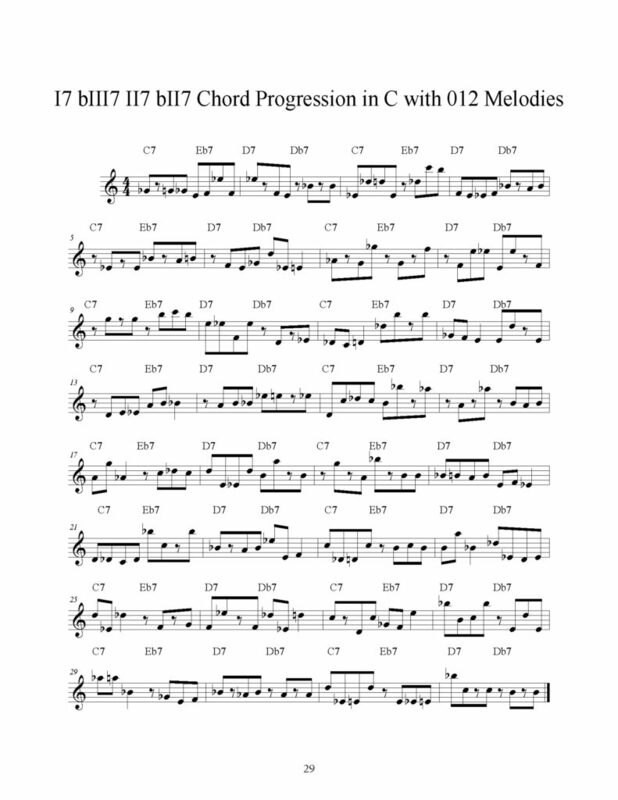 You can see that just one page of the Sonic Resource Guide can give you great detail on every scale and show you not only how to use it over chords, but additional information that you can use in various improvisational settings. By the way, Charlie would have called hexatonic scales broken into two trichords “Non-Tertial Double Mambos.” The idea of going back and forth between two three note groups is “Double Mambos.” I discuss this in the Tools for Modern Improvisation or My Music books. My Music covers more of my older music while Tools for Modern Improvisation includes newer concepts and composition. 2. A related book about trichords is Ultimate Arpeggio. It’s a look at all possible three note groupings of which there are 12 based on pitch class theory (see Sonic Resource Guide). It also covers the method of using any of the 3 note groups as melodies to outline chords. You are then given études to develop the idea of superimposing these 3 note groups over common chord progressions. All Études have MP3s at three different tempos to help you learn. Below is a couple of excerpts from this book. First we have the 012 pitch class set. This page includes the chords this scale can be played over. It also includes the 18 possible ways you can play this 3 note arpeggio. Ultimate Arpeggio includes Études for all 12 three note combinations. These Études take the pitch class set and apply it to common chord progressions in all keys. MP3s are included so that you can hear the examples, but also gradually increase the tempo as you practice the exercise. 3. Most of the ChopsBuster books cover different applications of 3 and 4 note groups to various situations. Most are very long exercises covering some possible application of a particular concept in all permutations or keys or both. 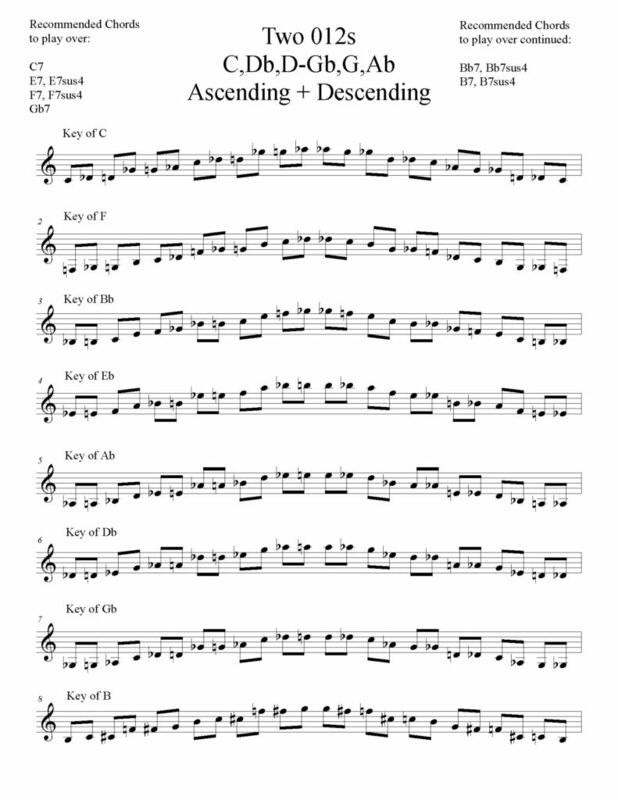 There are over 18 ChopBuster books that deal with some aspect of “Pitch Class Set improvisation.” Below is an example from ChopBuster: Two Trichord Ascending and Descending Scales. This course shows you some awesome ways to play the 0,1,2,6,7,8 pitch class set. This is the same pitch class set we showed earlier from the “Sonic Resource Guide.” Notice that you get these melodic lines in all keys and the chords that this line works over are also included. 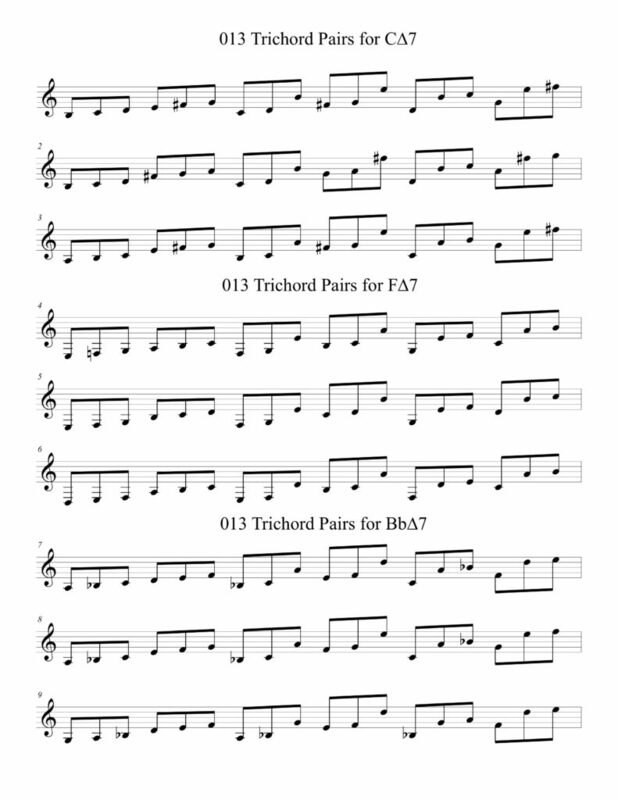 If you want to hear this 0,1,2,6,7,8 pitch class set in a real musical setting check out the video at the top of the page for the Trichord Sweeps Pairs Course. 4. Ultimate Three Note Chord Lexicon looks at each of the 12 three note groups and gives you all the chords derived from these three note groups as well as études and more information. It provides guitar voicings for chords, too. It’s an extensive project and as of this writing I’ve only finished 012, 013 and 014. 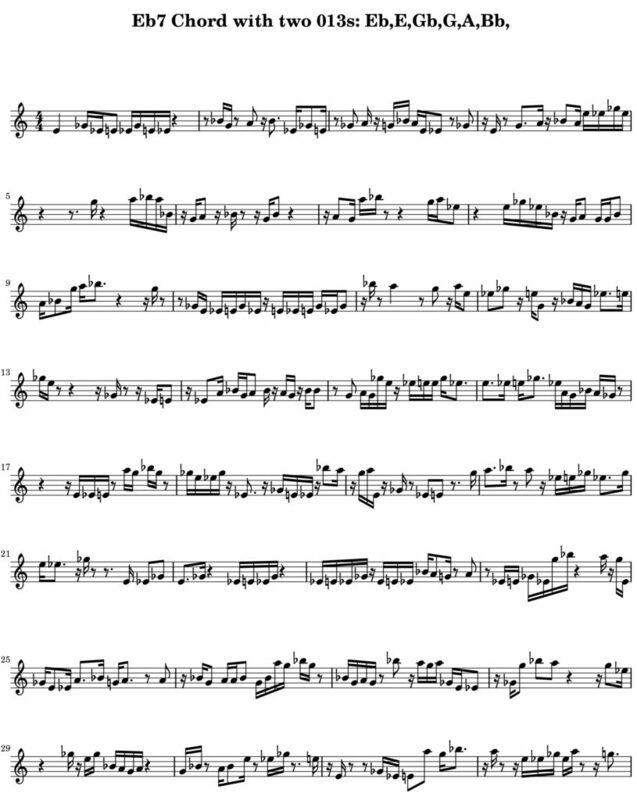 Midifiles and MP3s at multiple tempos are includes as are further Études in different styles. These are some really hip sounding Études, and are highly recommended; I think you’ll get a kick out of them. You can hear more examples on the 013 Hexatonic Études page. 6. Two books Symmetrical Trichord Pairs and Trichord Sweep Pairs look at the combination of two three note groups for all 12 possible 3 note combinations. IMHO these are super hip melodies that can be played over various chords. The “Pairs” are organized by chord type i.e. Major, Minor, Dominant etc… Below is an example from the Symmetrical Trichord Pairs course. It shows how to combine two 013 trichords to fit over a major 7 chord. The Trichord Sweep Pairs Course looks at using the same idea of symmetrical trichord pairs but in an arpeggio. This course gives you 2440 pages of sweep patterns, including guitar diagrams for many of the sweeps. 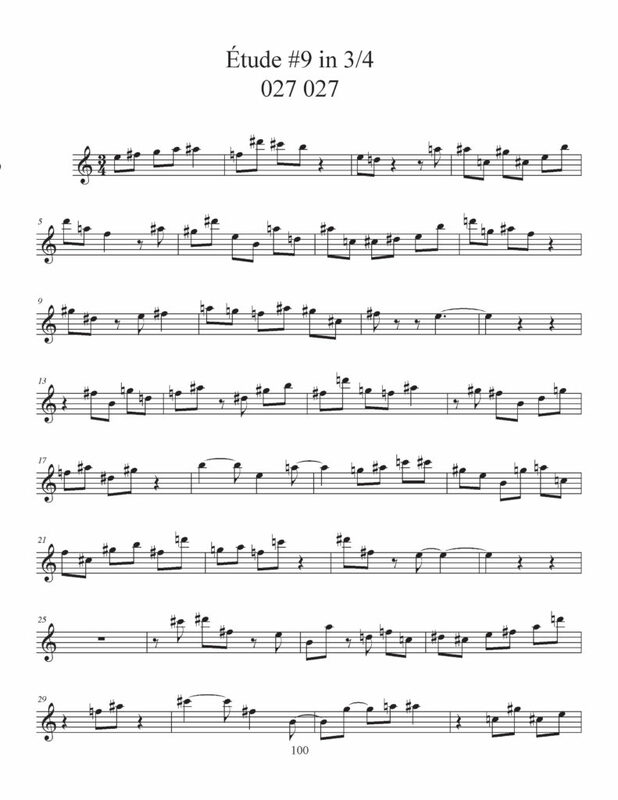 The page below shows you another section of the course that just gives notes for sweeps but also includes fingerings for easy to play sweeps. You can hear and see video demonstrations of both the Symmetrical Trichord Pairs and Trichord Sweep Pairs on the Trichord Sweep Pairs webpage. Time Transformation is a combination of 027 027 études with superimpositions of various meters over other meters. It’s a must own in my opinion because it covers pitch class set improvisation AND time superimposition within one course. This book gives you études in 3/4, 4/4, 5/4, 6/4 and 7/4 where 027 027 is used in and outside the key center. You can also superimpose these études over the MP3 grooves that come with the course. Below is an example from the 3/4 Étude in E minor. Notice how the 027’s switch in and out of the key center. This creates a very interesting modern improvisational sound. By the way Set Theory for Improvisation 027 027 contains a subset of Time Transformation so only buy that book if you just want to dabble in 027 027 concept with some études but no time superimposition. Set Theory for Improvisation 027 016 is a great book because it gives you some études taking 027 016 in and out of the key center. Great melodic lines! 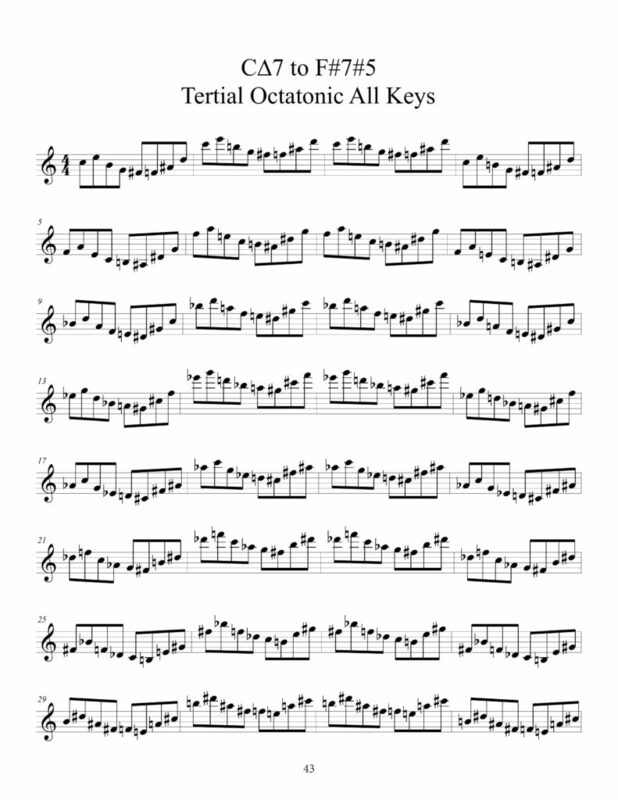 There are étude/permutation exercises to help you apply and hear the sound of each Two Tetrad combination. Again these are great melodic lines to create a modern sound in your improvisation and composition. 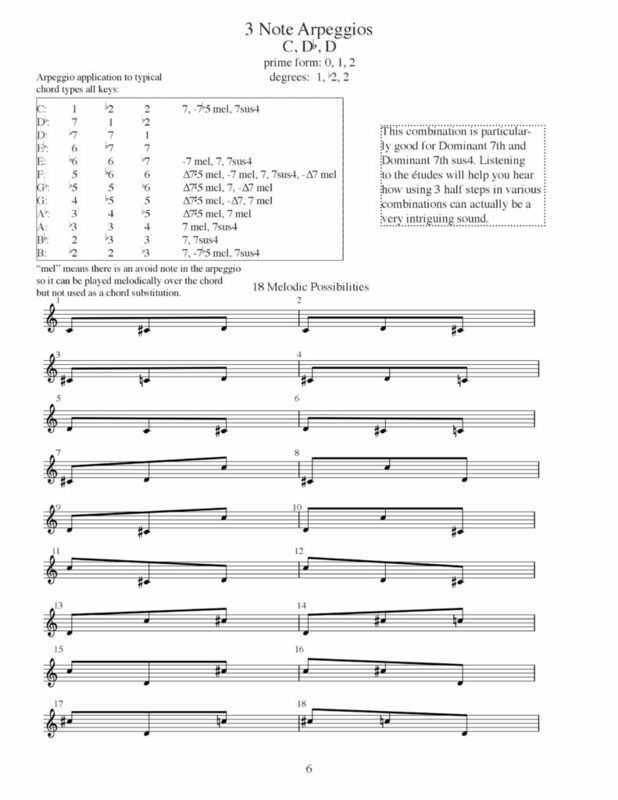 Midifiles and MP3 recordings of these Étude/Exercises are included with the Tertial Intervallics Course. One final note: there are other courses such as Harmonic Analysis, Scale Analysis, Tools for Music Mastery One and Essential Scales that give you the background of the way Charlie saw harmony, scales, and scales with approach notes. 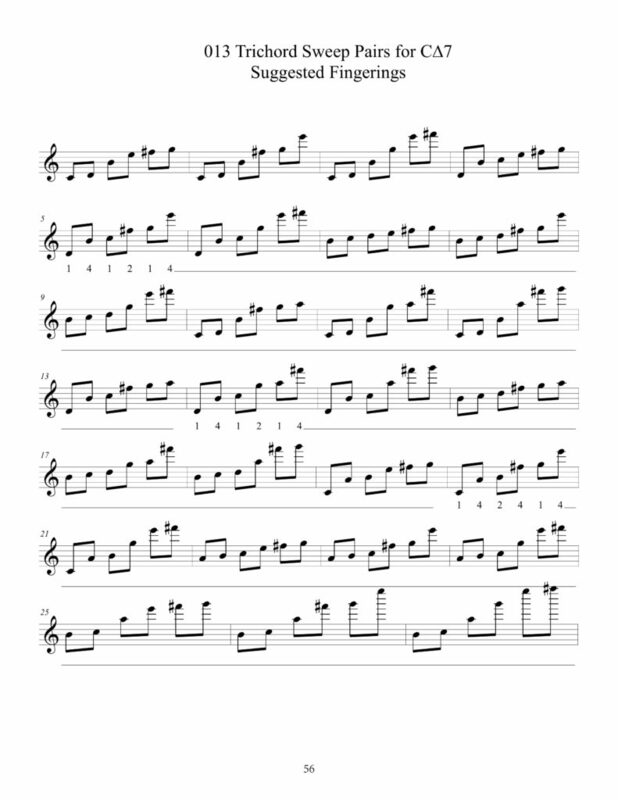 Tools for Music Mastery Two contains the application of Charlie’s Rhythm Exercises to études. It’s also a great book for ear training. This gives you an overview of the courses, and some information to show you how each book fits into the realm of modern improvisation. As always, I look forward to your questions. I also recommend checking out my duo with Judi Silvano called Sonic Twist®. There is a lot of great examples of me using pitch class sets.